There is growing concern that the remedial math courses taken by most community college students unnecessarily divert some students from earning a degree. Anecdotes of students who thought they had completed their math requirements in high school only to have remedial courses delay their progress through college are common. In addition, research has shown that African American and Latino students are disproportionately affected, frequently facing three or four remedial math classes. Redesigning the placement policies that assign students to these sequences could be as important as redesigning the curricula into which students are placed. This is the third report in Degrees of Freedom, a series being published by LearningWorks and Policy Analysis for California Education (PACE) to explore the role of math as a gatekeeper in higher education. It examines concerns that placement policies unfairly send the majority of community college students to remedial math, deterring them from completing college. It also considers how changes in these policies interact with university placement policies as well as with K-12 college readiness strategies. Remedial Math Placement: A Community College Penalty? The awareness that many students who perform well in high school math are assigned to community college remedial courses is contributing to discomfort with the current uses of placement exams. A frequent response to such discrepancies has been to fault high school instruction or curriculum. But recent research findings add to concerns about unfair placement practices: For example, community college students are more likely to require remedial math courses than university students with similar records. And about a quarter of students placed into community college remedial math courses could have succeeded in college-level courses. High school grades also appear to be better predictors of success in college math courses than the placement tests that are typically used. 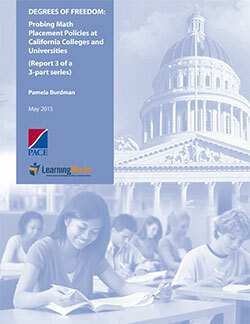 An estimated 85 percent of California’s community college students take remedial courses. While the state’s university systems require students seeking to transfer to complete the equivalent of three years of high school math (i.e., through Algebra 2) as a prerequisite to any transferable math course, they have no purview over how community colleges measure that proficiency. Furthermore, due to their different enrollment priorities, California’s three higher education systems – the California Community Colleges, California State University (CSU), and the University of California (UC) – approach math readiness very differently, ranging from the presumption of readiness at most UC campuses to community colleges’ default assumption that most students are underprepared. Math requirements’ role as a filter raises the risk that students could be unfairly delayed in earning a degree or diverted from completing college altogether. But that role is changing: A new assessment and new placement practices at the community college level along with new K-12 Common Core-aligned tests that will exempt some students from placement testing will change the face of remedial placement in the state.